Landfall Island Wildlife Sanctuary LIWS is one of the Wildlife Sanctuaries in Andaman and Nicobar and it is located in the Andaman and Nicobar Islands of India. It is approximately 228 km 141.67 miles away from Port Blair city in Andaman and Nicobar Islands, 1,379 km 856.87 miles away from Chennai and 1,139 km 707.74 miles away from Visakhapatnam cities in India. Nagarjunsagar Srisailam Tiger Reserve is the largest Tiger reserve in India . The reserve spreads over five districts, Nalgonda District, Mahbubnagar district, Kurnool District, Prakasam District and Guntur District. nearElavurAndNelloreandChittoordistricts ofAndhra PradeshinSouth India.Pulicat Lakeis the second largest brackish water eco system in India afterChilka lakeinOrissa.International name: Pulicat Lake Wildlife Sanctuary,IBACode: IN261,Criteria: A1, A4iii. Pocharam Wildlife Sanctuary is a forest and wildlife sanctuary located 15 km from Medak and 115 km from Hyderabad, Telangana, India. Pakhui Tiger Reserve is a Project Tiger tiger reserve in the East Kameng district of Arunachal Pradesh in northeastern India. The 862 square kilometres reserve is protected by the Department of Environment and Forest of Arunachal Pradesh. Eaglenest or Eagles Nest Wildlife Sanctuary is a protected area of India in the Himalayan foothills of West Kameng District, Arunachal Pradesh. 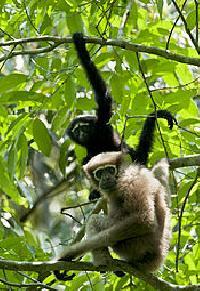 The Hoollongapar Gibbon Sanctuary, formerly known as the Gibbon Wildlife Sanctuary or Hollongapar Reserve Forest, is an isolated protected area of evergreen forest located in Assam, India. ThePong Dam, also known as theBeas Dam, is an earth fillembankment damon theBeas Riverjust upstream ofTalwarain the state ofHimachal Pradesh, India. The purpose of the dam is water storage for irrigation andhydroelectricpower generation.As the second phase of the Beas Project, construction on the dam began in 1961 and was completed in 1974. At the time of its completion, the Pong Dam was the tallest of its type in India.The lake created by the dam,Maharana Pratap Sagar, became a renowned bird sanctuary. Sharavatiis ariverwhich originates and flows entirely within the state ofKarnatakainIndia. It is one of the few westward flowing rivers of India and a major part of the river basin lies in theWestern Ghats. The famousJog Fallsare formed by this river. The river itself and the region around it are rich in biodiversity and are home to many rare species of flora and fauna.